Playing DFS NASCAR this week? Matthew Selz draws up the playbook for the Bass Pro Shops NRA Night Race at Bristol Motor Speedway. 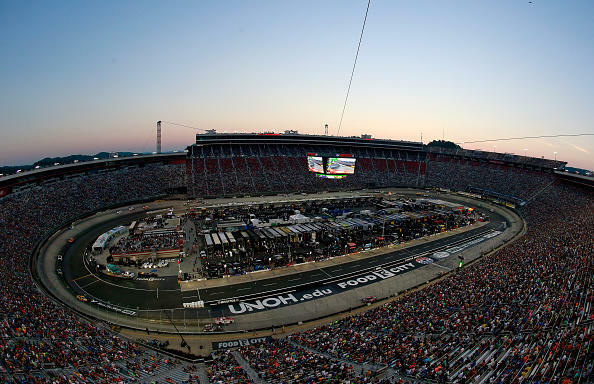 As Dale Earnhardt Jr. has coined, “it’s Bristol Baby!” There’s nothing like a night race and especially one that happens in the confines of the Bullring or The Last Great Colosseum as it’s known. 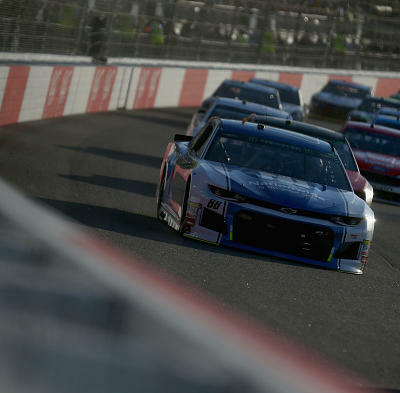 Forty cars going around the world’s fastest half-mile produces excitement and chaos in the same manner and the margin for error here is smaller than nearly anywhere else on the schedule. The track used to be a mostly single-groove race the last several years however with the spraying of the PJ1 compound on the track in the last few races, it has really made it a workable two groove track with the top groove generally being faster later in the race. With it becoming a two-groove track it is possible to move up through the filed quite a bit now, though in general the winner is still going to come from the top-10 starting spots as it has 26 of the last 36 races here. 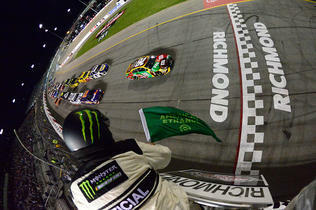 What can really allow you to move up or down is how well pit road goes for you both on green flag and caution stops. With the track being so small there are actually two parts to pit road with one on the front stretch and the other on the back stretch, each having their own entrance under green but become one continuous pit road under caution. The chaos on the track comes from incidents that can happen at any time, just like any other track, however with such tight quarters and turning laps in 15-16 seconds it makes crashes much harder to avoid, just ask Ryan Blaney. 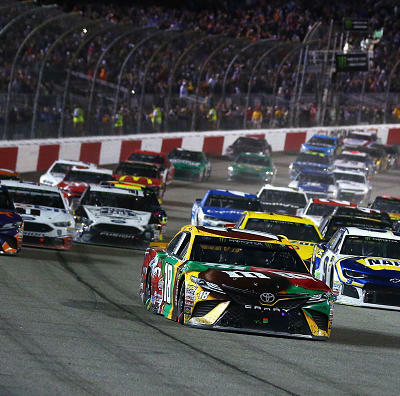 The other thing the confined quarters help with is allowing a few drivers to lead massive amounts of laps in a race, for example last August two different drivers posted DraftKings scores of well over 100 because of the amount of laps they led. The points were similar of FanDuel just because of the laps completed stat but in general short tracks have a massive amount of bonus points available. For example between fastest laps and laps led on DraftKings there are 375 total points available for the race not including PD points or finishing points and on FanDuel the total is 300 without including finishing or PD points. So why are the speeds so great and laps so fast? Well it’s because of the 26-30 degree banking in the turns and 6-10 degrees of bank on the straights that get steeper as you get closer to the outside wall. 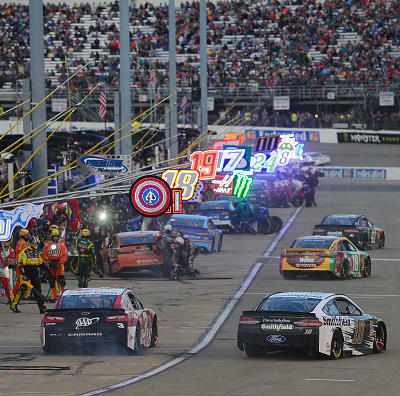 The drivers will use different lines at each end of the track to make the best lap times they can with several going low in Turns 1 & 2 and high in Turns 3 & 4 while others will enter high in the corner and exit on the bottom lane like Joey Logano tries to do. 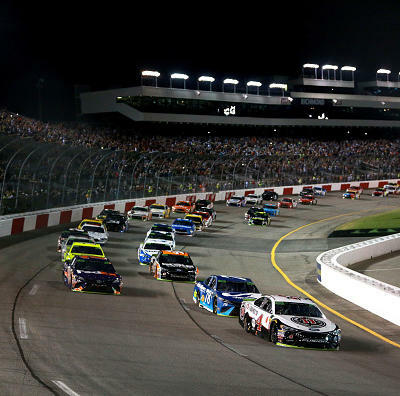 The stages are 125-125-250 laps with race being able to be called official at any point after the completion of Stage 2 (250 laps complete). There is rain in the forecast which is why the race was moved up one hour to green flag of 6:30 pm ET but that doesn’t mean they won’t have rain during the earlier start time. Busch has been dominant here. There’s no other way to put it. Two wins and 529 laps led are best in the field with his 228 fastest laps being second on the list in the last four races. 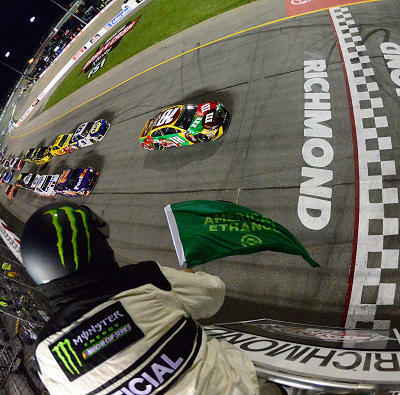 Busch’s 113.1 average driver rating is also the second-best among his peers in that time. However he does only have three top-10s in the last nine races he’s run here and has a tendency to be caught up in an incident. The laps led and wins and the fact that he’s swept the weekend twice here (the only driver in history to do that) makes him a cash or GPP play especially with his P3 starting spot and top-end speed once again. 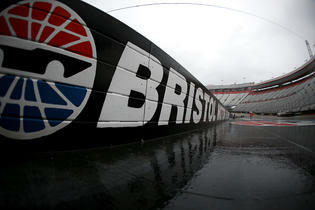 Harvick has a win, two top-fives, and is the only driver with four top-10s in the last four Bristol races. He also has 142 laps led and 131 fastest laps in that span and he’s the only driver with to break the 90% barrier in top-15 rate in that span as well. Harvick’s most impressive stat is his +20.7 PD in that span (yes that’s accurate and not a typo) which also has led to his field best average finish of 4.8. This week he won’t need to move up that far after qualifying P6 but it’s helpful to know that he can. The 4-car’s speed has been solid and he works for either lineup. Larson is on the pole for Saturday night’s race after an impressive showing in qualifying and in practice where he was amongst the fastest cars on the track at all times. In his last four races here he has a top-five and three top-10s with 472 laps led and 239 fastest laps. His 115.8 average rating is the best and his 89% top-15 rate is the next closest to Harvick there is. While it is unusual to play the pole-sitter in a cash game lineup, short tracks are different because you are selling out for laps led at the top of the lineup hence why Larson can be played in a cash or GPP roster. Truex is far cheaper than the other members of the big three and there’s a reason for that. He’s been mediocre on short tracks in his entire career, even through his last three years of dominant showings. He has eight top-fives and 20 top-10s in 75 career short track races. 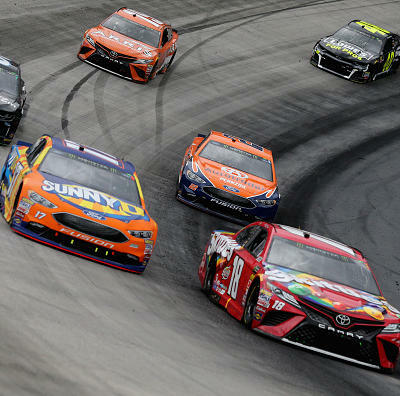 At Bristol specifically Truex has one finish better than 20th in the last four with 116 laps led and 130 fastest laps with a -10 PD mark as well. However I am writing him up because of his starting spot of P17 this week while he has shown top-five short run and long-run speed at times at practice. If he can buck his trend at short tracks this week his lower salary could pay nice dividends but he is still a GPP-only play. 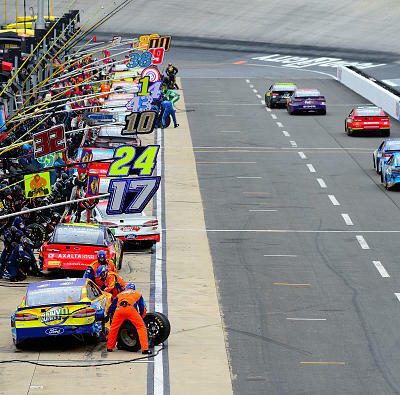 Denny is known to be good on short tracks and Bristol is no exception with an average finish of 7.5 and two top-fives, three top-10s, 33 laps led, and 72 fastest laps in the last four races. Hamlin has shown top-10 short and long-run speeds this week in both Friday practices before qualifying P7 for Saturday’s race. He has three top-fives and five top-10s in the last 10 races so there is good reason to believe he can stick in the top-10 much of the race, however he may not get you more than just his finishing spot which lowers his value just a tad. Still worthwhile in both formats though. 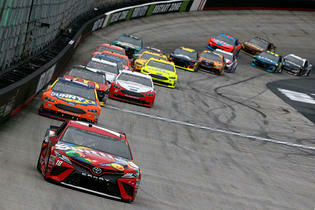 As mentioned in the practice notes, Logano has won two of the last four Bristol night races and in the last four races overall he has a top-five and three top-10s with 111 laps led and 52 fastest laps. 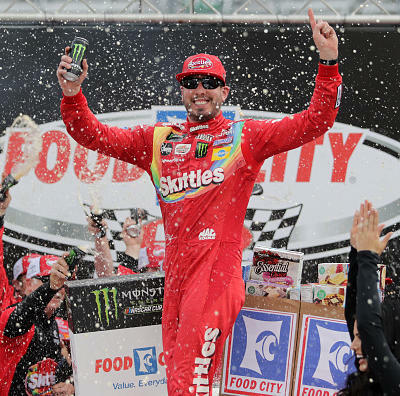 His consistency in the last 10 races gets even better with four top-fives and seven top-10s in that span and is one of only three drivers with an average rating of 100 or more. That being said Logano will have some work to do on Saturday after qualifying 19th and running around there in long-run speeds at practice but flashing better short run speed in the first practice. Given his speed he is more of a GPP play this week. Bowyer has a solid record here with two top-10s in the last four and four top-10s in the last 10 races here. Bowyer qualified P16 but ran slower than that at practice in single lap runs. In his first practice the 14-car ran the 11th best 10-lap average and in the final practice he ran the 23rd best average deep into the run at laps 41-50. There are a few circumstances that may make him more intriguing however. 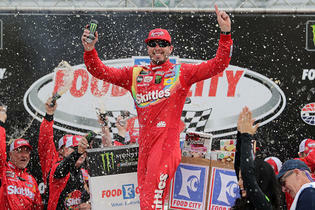 The two wins he has this year both came in races right before an off-week, like Bristol is, and both wins came with weather issues (Martinsville and snow and Michigan was rain-shortened) and this week has rain in the forecast as well. Given the lack of speed he is a GPP-play. Chase has shown nice speed here this week being among the fastest cars in each practice session with top-eight short run speed and top-10 long-run speed, until final practice when he ran 19th in that category. However his recent history here, all five races, shows one top-five (in his first race) and two top-10s total both coming in the spring race. He will start P2 this week but with several other fast cars in the top-10 it might be hard for him to do anything other than just run there. I like the price much better on DK than FD and he is workable for either lineup though the upside isn’t quite as high this week. If we flash back to the spring race here, Blaney had the best car on the track for much of the race before he got caught up in an accident caused by lap cars losing control. This week he again has similar speed with running inside the top-five in short and long-run speeds at different practices. Blaney will start P10 which is a little farther back than his average of 6.3 shows but with the speed he has he may be able to better his one top-10 in four races stat and perhaps add to his 100 laps led total as well. He is more of a GPP play this week. Johnson has a win here with two top-fives, three top-10s and 81 laps led and 95 fastest laps in the last four races, which is a great record for a guy that comes in as a mid-tier salary on both sites. He hasn’t been that JJ this year though and is still struggling to find speed despite his teammates and other Chevy teams finding it pretty well here. He starts 13th but he may have trouble holding that spot if he and Chad Knaus didn’t make adjustments between Friday evening and Saturday evening. A GPP-only play is what he amounts too. 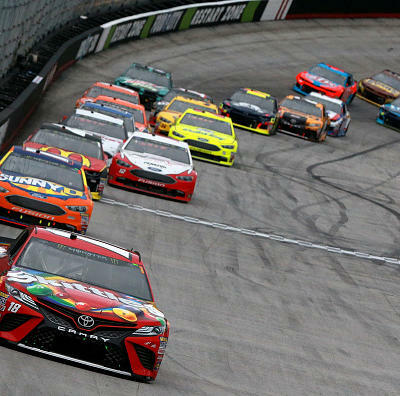 A quick look at the record here shows you one top-five finish and not really anything else in the last four races but he does have three top-fives and 221 laps led in the last 10 trips to the Tennessee track. Of the guys on this list he probably has shown the most consistent speed at practice and qualifying this week with all of it being inside the top-10 and his long-run speed has been there too. Staying in the top-10 will be nice but that won’t boost his score immensely limiting his upside a bit. He works for either lineup. Jones has one top-five and two top-20s in his three trips to Bristol with an impressive 260 laps led, the third most in the field. His 101.9 average rating in that span is one of seven to crack the century mark in that span. 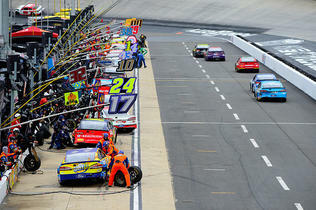 All of those laps led came in this race a year ago while he finished second to Kyle Busch after starting on the pole. This week he qualified 14th but ran long-run and short-run speeds much faster than that at practice which gives him nice PD upside and if things play out in his favor he could lead some laps too. Jones works for either lineup format this week and his price is pretty good on both sites. Two top-15s and three top-20s with five laps led is his record in the three career races he has here. The reason he’s in the playbook is due to the speed he’s shown this week compared to his qualifying spot. Suarez will start P21 but ran at least 10 spots better than that at practice including the ninth best 10-lap average in the final practice session. It’s starting to get to be a must win race for Suarez and with the speed he has and the potential pit strategy the team will employ should get him into the top-10 by race’s end. Cash or GPP works for him. 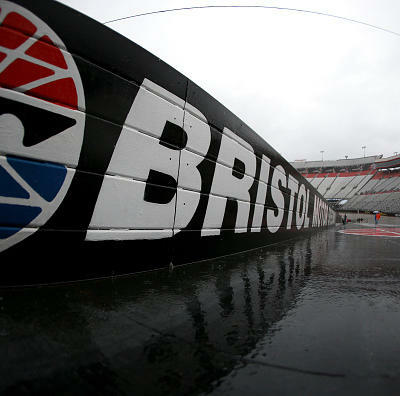 While a month and a half ago at Daytona was thought to be his last best chance to win a race before the playoffs, Bristol may actually be that race. 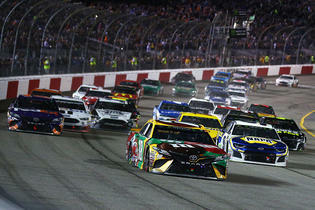 The driver of the 17-car has been very good here of late with two top-fives and three top-10s in the last four races with a +8.2 PD mark and is also one of only four drivers to complete everyone of the 2,000 laps in that span. In the last 10 races he has the best average finish at 9.6 and the most top-fives and top-10s without winning a race at four and six respectively. HIs 5,007 laps completed make him the only one over 5,000 and mean he’s not run seven laps in that span (5,014 total run). 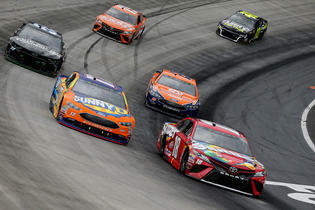 Qualifying P12 and running inside the top-five in single-lap and long-run averages make him a near must play this week. Bowman will start 22nd on Saturday night after running P3 and P7 single-lap runs at practice on Friday. He ran his first Cup in two seasons here this spring and finished P5 after starting P8. All of that is nice but there are some downsides like he never ran 10 consecutive laps at either practice so his long run speed is a bit of a mystery and prior to running in the spring race he only had one top-20 finish in four tries in the ’14 and ’15 seasons. The Hendrick Chevys have started to find the speed and grip necessary and his single-lap speed is nice but he is still a GPP-only option. Newman might be the sleeper play of the week with two top-10s and three top-20s in the last four races here and an average finish of 14.5 in that span. 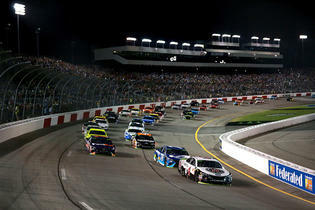 Over the last 10 he has a top-five, five top-10s, and seven top-15s and the second-most laps completed with 4,998. His P24 qualifying spot doesn’t show off his P11 and P18 single-lap speeds and his P4 10-lap average in the final session that was just .3 mph slower than Kyle Larson. His price tag is better on DK than FD but it’s still easily workable on both for either lineup especially cash. 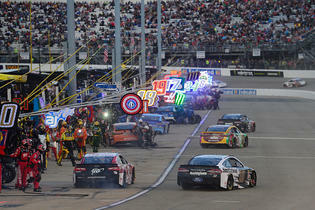 Bayne has a top-10 and three top-15s in his last four trips to his home track, having grown-up in Knoxville Tennessee. He also has a very good +8.3 PD in that span too. In the last seven races he’s run here, there’s a top-five, two top-10s, and five top-15s on his record. That kind of sneaky upside from a sub $6K and $7K driver respectively is nice as is the fact that he qualified P23 but ran faster than that at practice. A budget play in both formats is what he is. Two top-20s in the last four races with a PD of +6.2 is a nice record for a cheap guy. 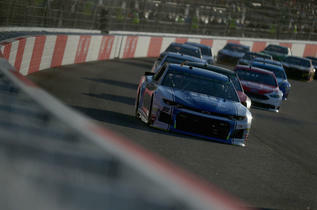 The speed isn’t as evident this week but with a proven record of moving up, he should be looked at as a nice budget play with PD upside, and with his name being brought up in discussions of who will replace Kurt Busch in the 41-car next year (if he leaves SHR), he will want to put good races on tape. LaJoie is another budget-friendly play with proven PD upside in the last three races he’s run here. An average starting spot of 34.7 in that span gives him a +9 mark when he finishes an average of 25.7 in that span. With some of the drivers you will want in your lineup for the higher upside points, the cheap guys will give salary relief at the bottom of the roster.